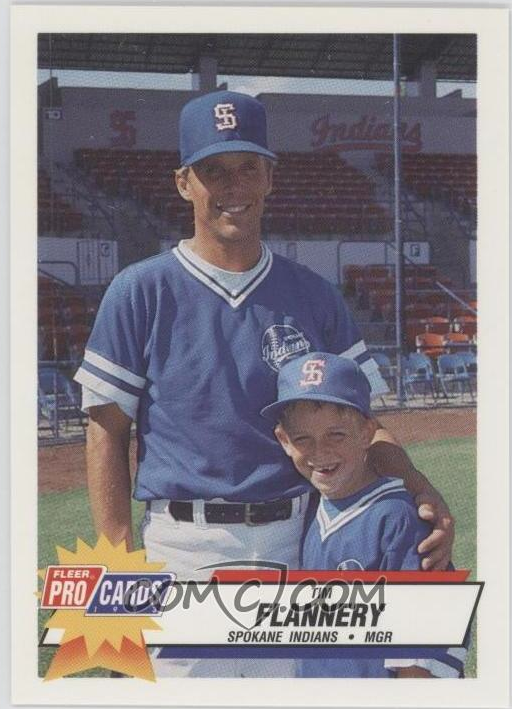 In celebration of the 2013 World Series being underway, I thought it would be fun to showcase a couple of caps from a Pacific Coast League franchise where St. Louis outfielder Carlos Beltran played: the Spokane Indians. The PCL is a league that was officially founded in 1903, just two years after MLB's American League. I find comfort in the fact that baseball has been played in the Pacific Northwest ever since the United States' Western Expansion reached the Oregon Territory. It's no secret that I heavily favor these old school caps made of 100% wool with the green-underbrims. I especially enjoy the way the royal blue and kelly green play off of each other here. The Spokane Indians have gone through a fair amount of affiliation changes over the years. Looking at the tags on the inside, I'd say that this cap is from either 1993 or 1992, yet not much earlier than that so this cap was probably from when they were a Padres affiliate. In the photos below you'll see a few cards featuring San Francisco Giants manager Bruce Bochy when he was the Indians' manager in 1989 and the Giants' Third Base Coach Tim Flannery when he managed the team in 1993. They both seem to be wearing the same style cap as featured above so I'm fairly certain that this one is from that period. Here is a more current version of the Indians' cap. The "S" and "I" are still interlocking but the navy blue outline is a lot less visible than in the red outline in the version above. I'm not certain about what era this cap is from but the fact that it has a grey underbrim tells me that it has to be at least more current than a cap with a green underbrim. Another giveaway that this hat is of more recent years is the New Era "flag" logo on the wearer's left side of the cap. I usually prefer my caps to not have the "flag" logo but in the case of an all-red cap, I don't mind adding something else into the mix! In the photo below, it's evident that this cap is a snapback - thus disqualifying it from being a Fresh Fitted (?!?!) - which I think is interesting mainly because although almost all current minor league teams have a fitted cap, it wasn't always the norm in years past. I remember my hometown Tidewater Tides didn't get the fitted-cap treatment until the mid-1990's. Here's a look at the inside tags. Not much to talk about other than this cap (and the one above it) are definitely "Holy Grails" for me and hopefully one day I won't have to pay some ridiculous amount for one of these caps. Oh well, at least photos of the cap don't cost anyone a red cent! I thought to end this post with a card featuring former Spokane Indians player, Carlos Beltran. 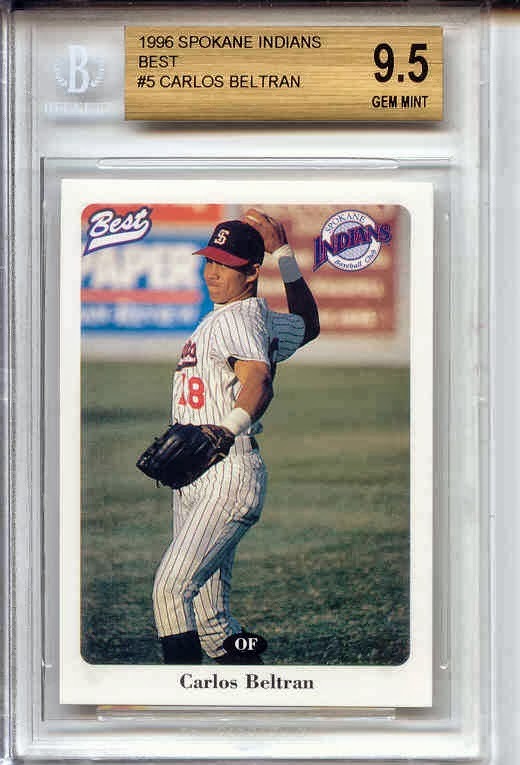 The Indians switched to the style of cap that Beltran is wearing in the card below in 1995 and since Beltran's only season in Spokane was in 1996, I wasn't able to track down a photo of him wearing the red version of this cap. It would have been pretty cool to compare how he looked wearing this cap versus what he currently looks like wearing a red cap in St. Louis. At any rate, because I rooted for Beltran and the Cardinals to beat the Dodgers in the National League Championship Series, I decided it would only be right to cheer them on toward beating Boston in the World Series.